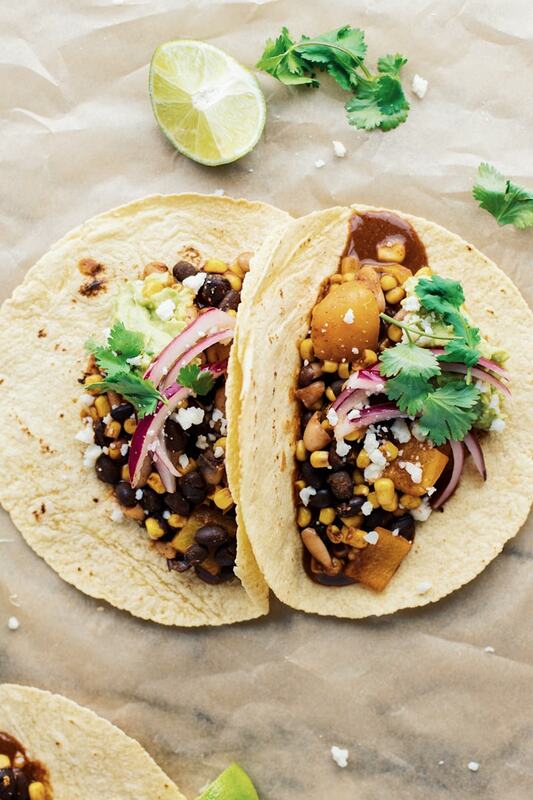 Mind-blowing Vegetarian Tacos – A healthy dinner that is SO flavorful, satisfying, and only takes 30 minutes to make. 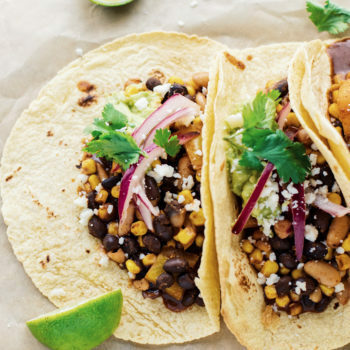 You will fall in love with everything about these tacos! 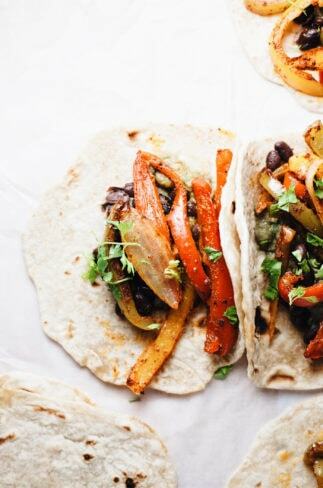 My current food obsession –> These life changing 30-minute Vegetarian Tacos. Warm corn tortillas with flavorful peppers, beans, and corn, then topped with crunchy pickled onions and creamy guacamole. 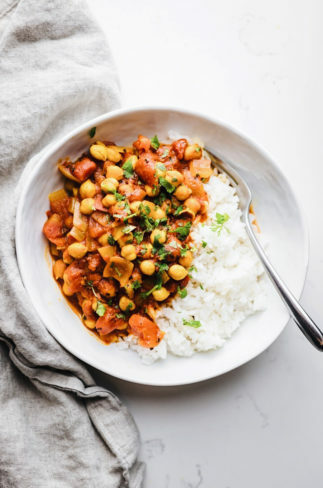 I currently make this recipe one to two times a week and it has quickly become one my favorite quick dinners to make. During the week we try to eat mostly plant-based, so I became inspired to create a veggie-based taco recipe that was satisfying without meat. 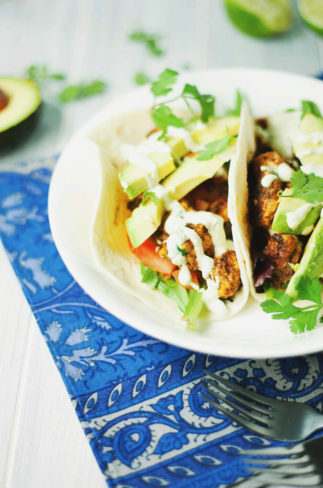 Whether you are a meat-lover or are following a vegan or vegetarian diet, I know you are going to love these amazing vegetarian tacos! On medium heat, saute peppers and red onions with olive oil for 5 minutes until soft. On low to medium heat stir in 1 can each of black beans, cannellini beans, and corn. Add seasonings and cook for 5-8 minutes, stirring occasionally. Then assemble tacos in corn tortillas with bean mixture, pickled onions, and guacamole. Let’s talk about pickled onions for a second. If you have ever had a taco with pickled onions, you’ll probably agree with me when I say – they make the whole taco come together. Not only are they crunchy, but they give this recipe the acid it needs to balance out all of the flavors. Whether you like onions or not, these are a must to complete your taco recipe! Don’t be intimidated, they are the easiest to make and store well in the refrigerator for other recipes. How to Make Pickled Onions: Thinly slice red onion, add to a jar or bowl with 1 1/2 cups of apple cider vinegar or distilled white vinegar, 2 tbsp coconut sugar (or regular sugar), and 1/4 tsp salt. Let sit with vinegar for 30 minutes while making tacos or several hours. These will pickle even more over time – store refrigerated in a sealed jar for up to 2 weeks. What veggies go in tacos? 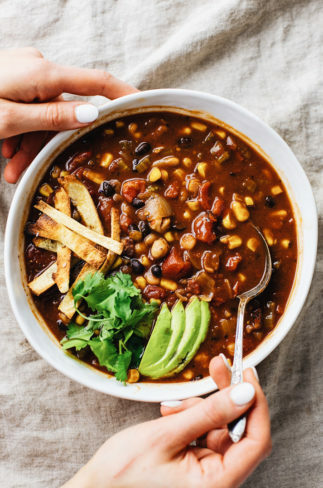 For veggie fillings: I recommend zucchinis, legumes, beans, lentils, mushrooms, corn, and red onions. Condiments that go with tacos: top your tacos with sour cream, salsa, guacamole, or cotija cheese. Corn tortillas are a healthier option when choosing tortillas – you can also use regular flour, almond flour, or whole wheat tortillas. No tortilla’s? Serve this recipe over rice and make it a taco bowl. Great for meal prep and equally delicious! Serve with brown rice, quinoa, or keep it simple with a vegetable salad. Mind-blowing Vegetarian Tacos - One of the BEST taco's I've ever had. A healthy dinner that is SO flavorful, satisfying, and only takes 30 minutes to make. You will fall in love with everything about these tacos! In a large saute pan on medium heat, saute peppers and red onions with olive oil for 5 minutes until soft. 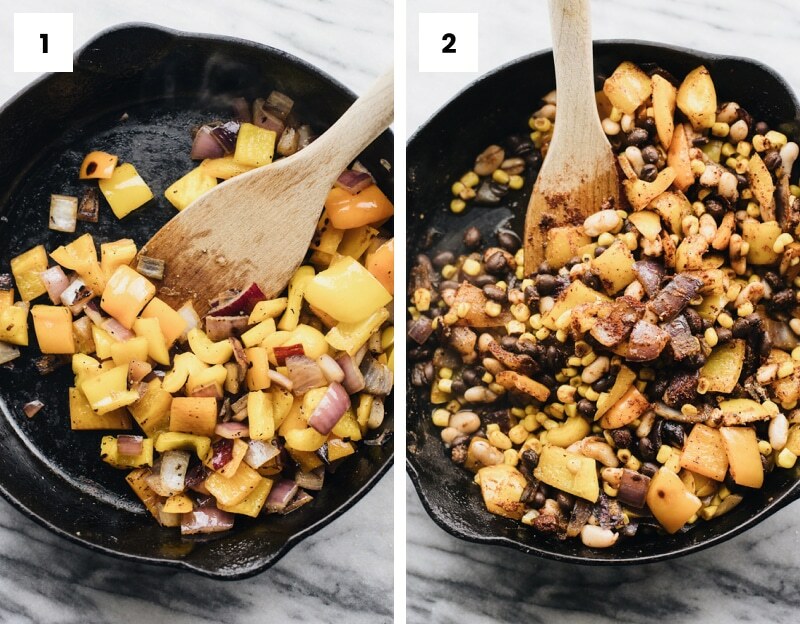 Lower heat and add 1 can each of black beans, cannellini beans, and corn. Add all of seasonings and cook for 5-8 minutes, stirring occasionally. Then assemble tacos in corn tortillas with bean mixture, pickled onions, and guacamole, and cilantro. Enjoy! How to Make EASY Guacamole: 2 mashed avocados, 1/2 tsp garlic powder, 1/4 tsp salt, 1 lime juice. 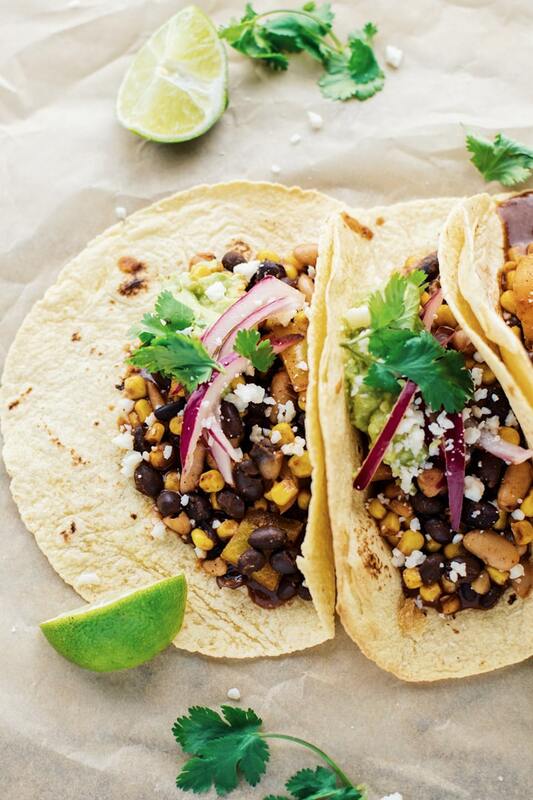 Mix together and serve with tacos. 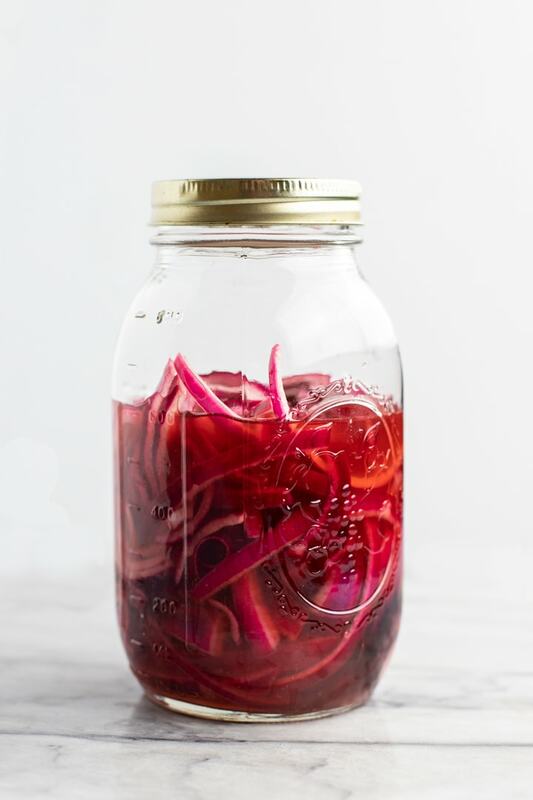 How to Make Pickled Onions: Thinly slice red onion, add to a jar or bowl with 1 1/2 cups of apple cider vinegar or distilled white vinegar, 2 tbsp coconut sugar (or regular sugar), and 1/4 tsp salt. Let sit with vinegar for 30 minutes while making tacos or several hours. These will pickle even more over time - store refrigerated in a sealed jar for up to 2 weeks. Corn tortillas are a healthier option when choosing tortillas - you can also use regular flour, almond flour, or whole wheat tortillas. No tortilla's? Serve this recipe over rice and make it a taco bowl. Great for meal prep and equally delicious!